Ever dream of comfort while driving? Well now you have some options. 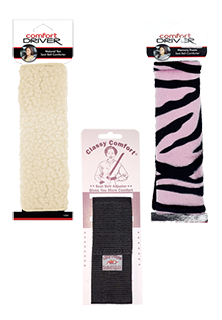 Check out our seat belt comforters. We have standard and sheep skin in three colors; black, gray, and tan. These will definitely give you some comfort while driving. We have the lowest prices in the nation. GUARANTEED!